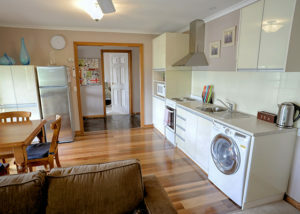 “Barkly Views” is a cosy one bedroom flat with fabulous views over Ballarat from the elevated veranda. 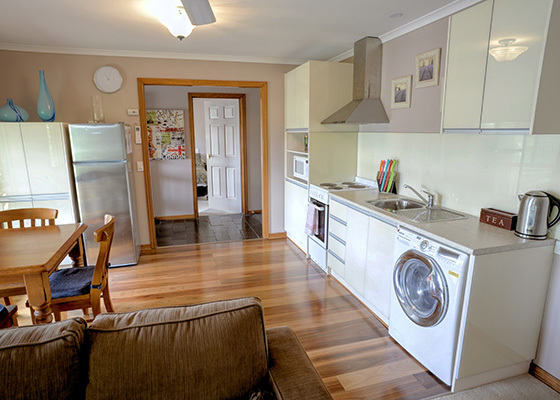 Comfortable and snug, “Barkly Views” has everything you need for a longer stay – with a new kitchen, quality furnishings, linen and towels, gas heating, air conditioner and laundry facilities. This welcoming, home-like flat is well suited to a single person or couple. The large windows in the kitchen/dining/living areas flood the space with light and views, giving a feeling of generous proportions. The comfortable couch is well positioned for the wooden flooring and new kitchen give a modern feel to this solid 1990’s home. The snug, carpeted bedroom with queen size bed, quality linen and electric blanket caters for a good night’s sleep. The bedroom features a huge, walk-in wardrobe, ensuite and large windows with great views. You will find a table and chairs on the front veranda – here you can relax with a beverage and watch the world go by from your lofty vantage point. Or cosy up with a good book on a warm summer day. On-street parking is available in front of the property. From this desirable central location in Golden Point you are within a few blocks of a good choice of restaurants, cafés, supermarkets and shops. For those with fitness needs, there are jogging and cycling tracks nearby that will take you for miles.